The mission of the 420 Archive is to research, collect and preserve for public enrichment the history, activism and culture of 20th and 21st century U. S. cannabis production and marijuana prohibition with an emphasis on California and the western United States. One of the 420 Archive’s key archival objectives is to collect materials that document the organizational and activist history of several well-known groups and individuals based in the United States. The 420 Archives pays particular attention to the materials of grassroots activist organizations, as these types of groups often leave behind very little material evidence of their activities. The 420 Archive actively collects, preserves, and makes available records of U.S. based organizations that are focused on decriminalization and the repeal of marijuana prohibition. The 420 Archive also collects the records of individuals. These collections typically serve to document an individual’s involvement in organizing and activism around the decriminalization and the repeal of marijuana prohibition. The 420 Archive will also maintains an extensive and ever-growing set of files corresponding to various subjects or topics related to the decriminalization and the repeal of marijuana prohibition. These files contain photographs, flyers and leaflets, invitations and announcements, newspaper clippings and research. Topics include: Political and health-related organizations or institutions; Social groups or organizations; Individuals, including but not limited to leaders in the community and/or political figures; Events and demonstrations, such as community events or protest marches. The 420 Archive seeks to build a collection of Marijuana related publications. The 420 Archive actively seeks photographs that help tell the story of decriminalization and the fight to repeal marijuana prohibition. The 420 Archive will also maintain a collection numerous ephemeral items and historical artifacts relevant to marijuana prohibition history, with a particular emphasis on California and western United States. Ephemeral items and artifacts include: buttons, posters, t-shirts, dispensary specific ephemera, etc. The 420 Archive records and provides access to the histories of individuals whose lives have influenced the cultivation, use and legal status of marijuana. This collection of oral histories is both expansive and representative of the diversity of ideologies in the community. It is the responsibility of the Board of Directors to establish policies and programs that address issues of the accessioning and deaccessioning of archival records and materials. The 420 Archive solicits donations of materials from individuals, organizations, social groups, and cultural institutions whose focus is the decriminalization and the fight to repeal marijuana prohibition. The 420 Archive does not purchase manuscripts or archival materials. The 420 Archive welcomes unsolicited donations of materials; however, donors will be expected to complete a Donor Agreement Form. With respect to historically significant materials that do not adhere to the provisions of this collection policy, The 420 Archive attempts to ensure their preservation in an appropriate archival center, repository, or institution. 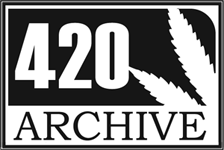 All donors to the 420 Archive will be expected to complete a Donor Agreement Form; oral history participants will be expected to complete an Oral History Release Form.